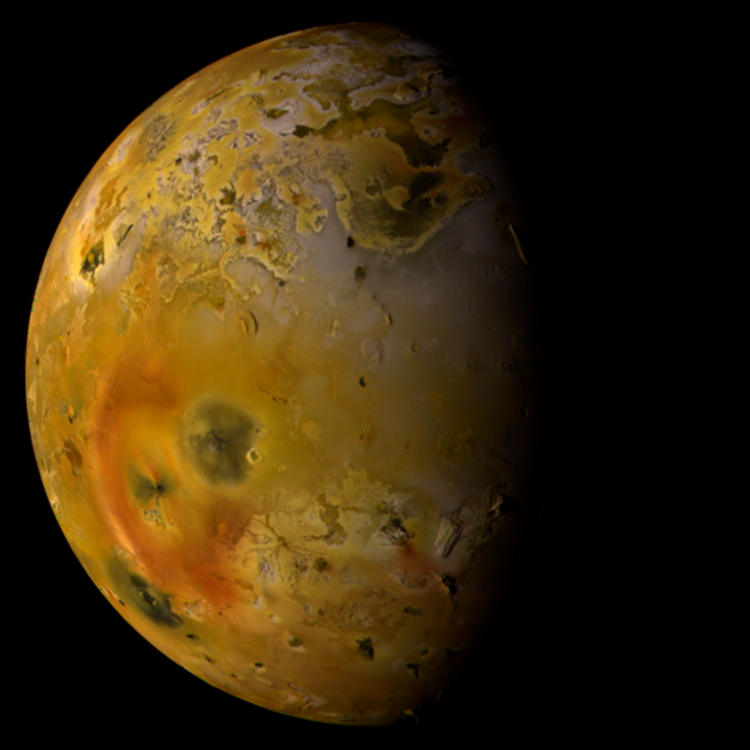 Beginning this week, we will take a look at one of Io's hundreds of volcanoes each week. For this premiere post, we will take a look at Pillan, a volcano that is notable for its large eruption during the Galileo Nominal Mission in 1997. The eruption resulted in a dark, pyroclastic more than 400 kilometers (250 miles) across, a fresh lava flow with an area of 3100 square kilometers (1,200 square miles), and a deposit created by a dusty plume 100-120 kilometers (60-75 miles) in height that partially covered the iconic red ring plume deposit of Pele. The massive eruption, one of the most significant observed by Galileo in terms of energy output and the areal surface coverage of the fresh lava, began in May 1997 and was in full swing by June 28 when the SSI camera onboard Galileo detected a bright hotspot at the volcano when the instrument observed Io while the satellite was in the shadow of Jupiter. And to think, nothing strange had ever been noted at this volcano. Pillan Patera was first seen during the Voyager 1 encounter in March 1979, the first time Io's surface had been seen in any kind of detail. 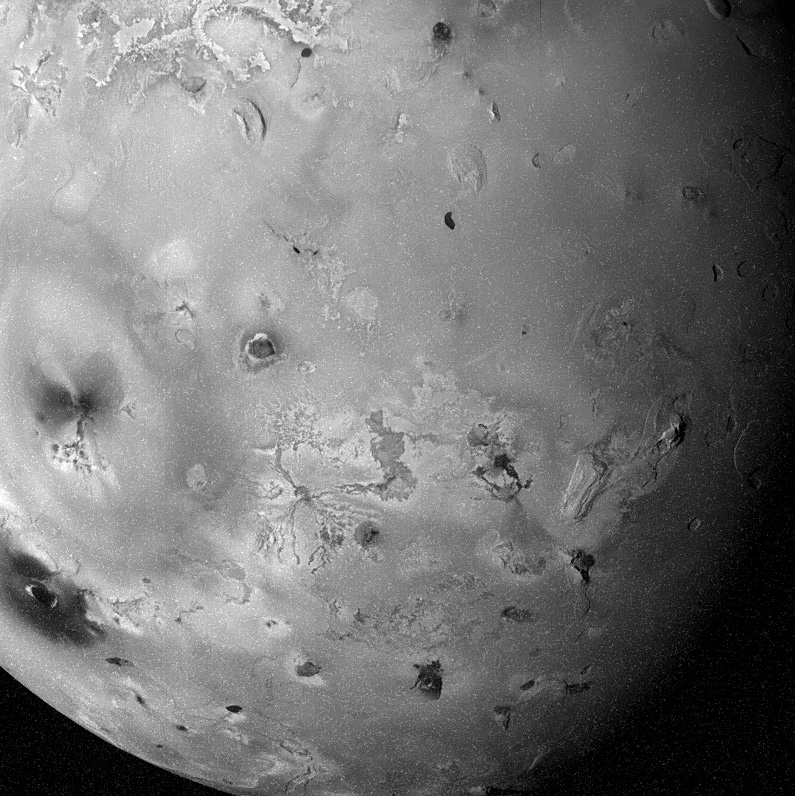 Voyager scientists were astonished by the sheer number of volcanic features on Io's surface. However, Pillan was not of much interest. The volcanic depression was not even named until shortly before the eruption in 1997. It was seen at a resolution of 500 meters (1,640 feet) per pixel in the large south polar mosaic, so the lack of interest wasn't for lack of good images of the region. Image number 1 at right shows the region around Pillan. You can see Pele, a persistently active lava lake near lower left. Pillan wasn't really distinguishable from the surrounding terrain, if it weren't for the two kilometer high margin that separates the floor of the patera from the surrounding plains. The image does provide some details about the nearby terrain that was not seen at this kind of detail by Galileo. To the north of the speech-bubble shaped patera is a mountain now named Pillan Mons. This mountain is bisected by a pair of fractures and appears to be in a state of collapse with a landslide deposit on the northeast side of the mountain. This deposit is frequently coated in bright sulfur dioxide frost, perhaps from sapping from the mountain. Between Pillan Patera and Pillan Mons is the V-shaped source fissure of the 1997 eruption. During the Voyager mission, this fissure was surrounded by bright material, likely older lava flows that have been coated in sulfur and sulfur dioxide after an earlier eruption. Interestingly, some of these flows have the same shaped as the 1997 flows. Once again on Io, eruptions have happened the exact same way before, and they will do so again. 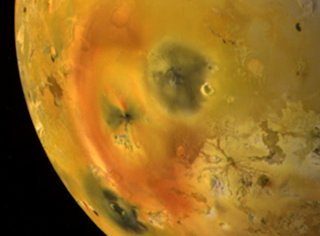 Galileo entered orbit around Jupiter in 1995 and imaged Io on a semi-monthly basis starting in June 1996. Many of these early images, intended to monitor changes in the plume deposit around Pele, also revealed apparently changes at Pillan Patera. Were these real changes? 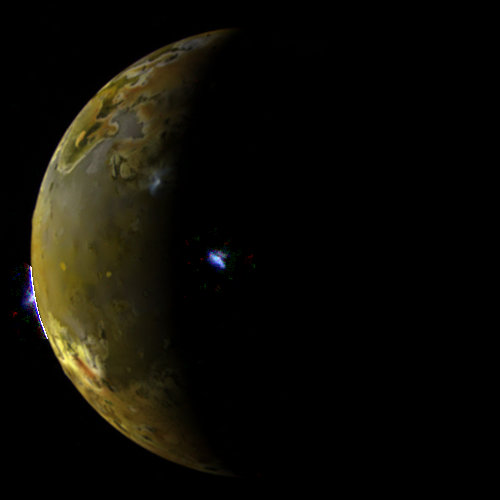 During Galileo's first orbit in June 1996, Pillan Patera appeared brighter than its surroundings (see image 2 above). However, it had darkened considerably by September 1996 during the next orbit. Was this due to an eruption? Galileo would observed Pillan at even higher resolution during C3, the next orbit in November. This time, Pillan had the same albedo as its surroundings. Was this due to rapid surface changes? Turns out, it was due to an odd phase function of the surface materials on the floor of the patera. When Pillan was viewed at low phase angles, like G2 and later in E6 in February 1997, the surface appears dark. When viewed at higher phase angles, the surface appears brighter. This is the result of a thin layer of bright sulfur dioxide frost coating dark silicate materials on the patera floor. This makes the floor of Pillan quite forward scattering. 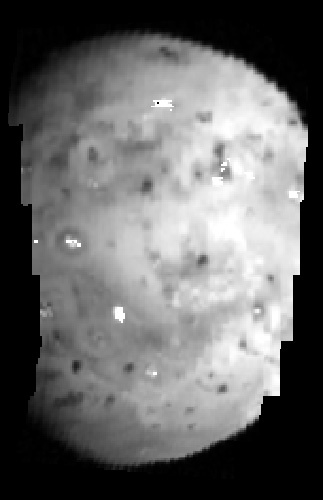 You can see a similar effect taken to extremes near Loki in New Horizons images. In terms of volcanic activity, some slight activity was seen by the Near-Infrared Mapping Spectrometer (NIMS) in November 1996 and February 1997, but neither detections approached the level of activity seen later in the nominal mission. Special attention should be paid to the clear filter images from November 1996, the highest resolution data set of the Pillan region from Galileo prior to the eruption. The image clearly shows the carrot-shaped ^ of the 1997 eruption source. It appears as a thin, dark fissure in this image, which would be around six kilometers wide based on this data. Surrounding this thin fissure is a diffuse region of darkish material. A similar albedo pattern is seen at other Ionian fissures, such as within Lei Kung Fluctus, and most intriguingly at East Girru, shown paired with the November 1996 image of Pillan. East Girru was the source of a bright eruption that was just getting going during the New Horizons flyby in late February 2007. Unfortunately, I am going to have to cut this installment short (I want to get to Best Buy for the midnight sale of Starcraft II). Have no fear, tomorrow, when I am not working (or playing Starcraft II), I will continue this tale of fire fountains and black eyes tomorrow evening. 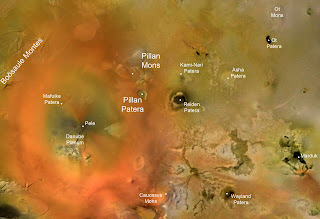 We will explore the significance of the shape of the Pillan eruption source vent. 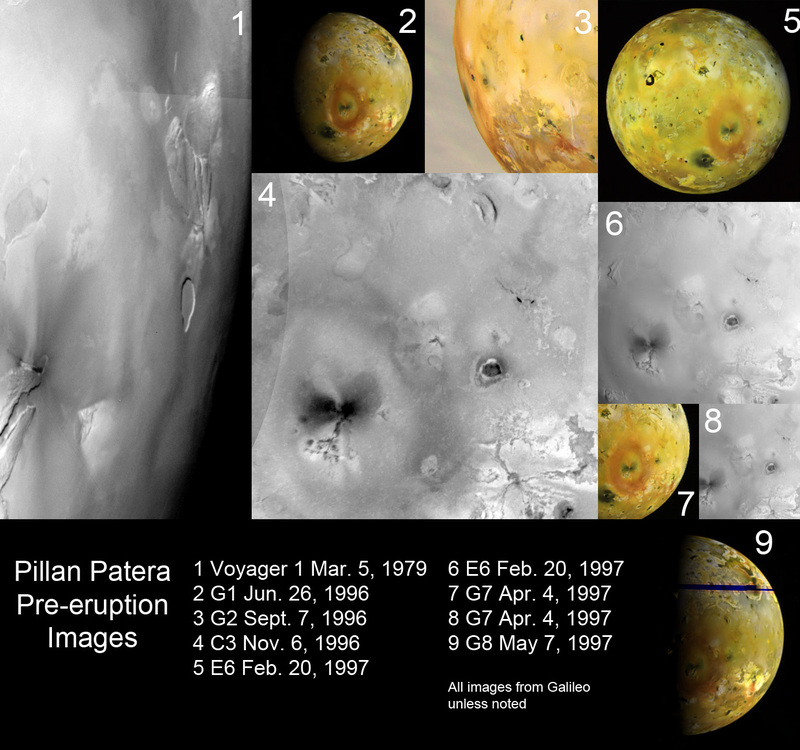 We will also look at Pillan's impact on our knowledge of Io and its interior. Finally, we will look at how the model it inspired was undone. Moons are fantastic worlds - with features unlike anything seen on Earth: giant sulfur-spewing volcanoes, globally cracked ice-covered surfaces, liquid lakes of hydrocarbons, and colossal watery plumes. Many of these worlds also happen to be the most likely places for life to evolve outside the Earth. How cool is that? The webchat takes place at 7pm PDT (10pm EDT) tonight. The popular BBC Two series, "Wonders of the Solar System", is finally making its way to this side of the Atlantic. The first episode, "Empire of the Sun" premieres on the Science Channel on Wednesday, August 4 at 9pm EDT/6pm PDT. The show, hosted by Brian Cox, was well received when it aired in the UK earlier this year. It covers various aspects of planetary science, from the Sun in the first episode, the formation of the Solar System and Saturn's rings in the second, planetary atmospheres in the third, geology in the fourth, and the role of water for life on Earth and elsewhere in the fifth. A significant section on Io, its volcanic activity, and the terrestrial lava lake analog at Erta'Ale will air in the fourth episode, "Dead or Alive." Thankfully, while it looks like they have changed the music, the world-wide version will have the same host as the BBC one, though given that he is an on air host, I don't really see how else you can do it. But at least they are not replacing him with Oprah. Tip o' the hat to Ashley Davies for the tip! Well, I should finally get to writing up an article on a new paper out this month in the Journal of Volcanology and Geothermal Research on Io titled, "The thermal signature of volcanic eruptions on Io and Earth." The authors for this paper are Ashley Davies (pictured at right with the nice manly man-beard), Laszlo Kestay (formerly Keszthelyi), and Andrew Harris. Unfortunately, my delay in writing something up about this paper for the blog has meant that other bloggers have had time to scoop me. Seriously, how was I to know that someone would write up a post about an Io paper before me? This hasn't really happened before. You can read Emily Lakdawalla's excellent discussion of Ionian volcanism and this paper's treatment of it on her Planetary Society Blog. Davies emailed out copies of the paper to various Ionians and Emily, which as Emily states, is something other scientists should take note of. However, I have to one up Emily just a little bit. He told me about the paper personally last week :-p So there! Though maybe my parody ads for Io have had some effect after all? Anyways, enough with my professional jealousies [humor using hyperbole alert! ], let's get to the paper, shall we. In the article, the authors investigate methods for identifying volcanic eruption styles using low spatial resolution, near-infrared data. 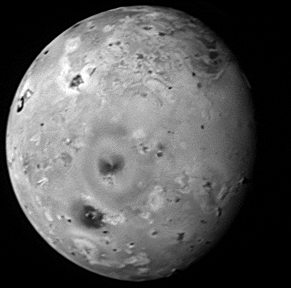 This is particularly useful for Io, as the only thermal observations available of Io have a resolution of at best a few kilometers per pixel but more typically have pixel sizes of tens to a couple hundred kilometers across. The problem of spatial resolution is compounded in more recent data from the Keck telescope, where observations are typically acquired at only a few wavelengths between one and five microns. Just last week, Franck Marchis showed off data on his blog showing Io at three such bandpasses from the Keck telescope at 2.1, 3.8, and 4.7 μm. Davies and his two co-authors also examined satellite data of terrestrial volcanoes, which could then be compared with observational ground-truth. This provided a way to test their method. Davies and his co-authors determined that by examining the ratio between thermal output at two and five microns of a volcano in Galileo NIMS or ground-based data and tracking how that ratio changes with time, they could characterize the style of volcanic activity. These different styles include open-channel or insulated lava flows (like those seen at Kilauea), lava fountains, lava lakes, lava domes, silicic lava flows, though the latter two, while important volcanic features on Earth, have not been identified on Io. This works because the peak wavelength for the thermal emission of a lava flow or lava lake shifts to longer and longer wavelengths as it cools. Basaltic lava that has only been cooling for one second has a peak thermal emission wavelength of two microns, while the thermal emission of lava that has been cooling for more than seven hours (or two hours on Earth) peaks around five microns. So more vigorously active eruptions will have more fresh lava exposed than older, more quiescent eruptions, and thus will have greater 2 μm : 5 μm ratio. More active volcanic eruptions include Tvashtar's back in 1999 and 2007, when lava curtains were observed at one of its constituent paterae. The eruptions of Pillan in 1997 and Surt in 2001 also fit this model, with Surt having a 2 μm : 5 μm ratio of 2. Also typical of these outburst eruptions is their short duration. Over time, the 2 μm : 5 μm ratio at these eruptions decreases as the fire fountaining ceases and the thermal emission becomes dominated by large areas of cooling lava. The volcano I profiled on Sunday maybe in this stage. 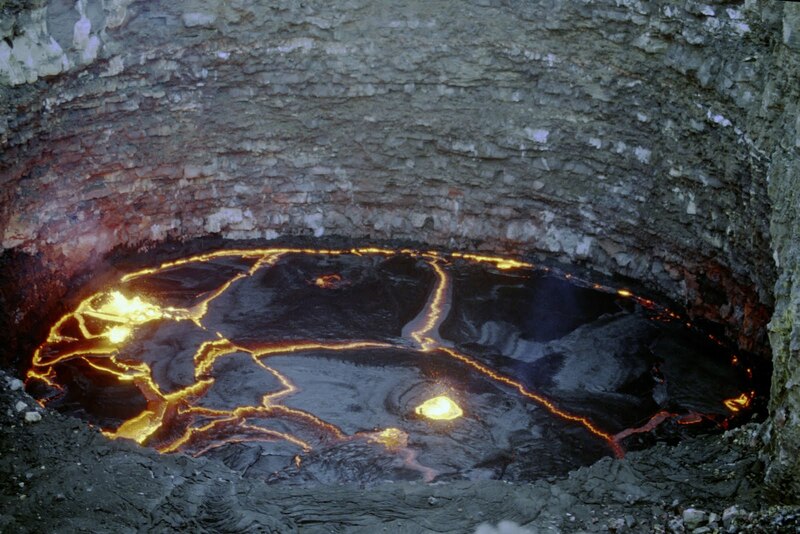 High 2 μm : 5 μm ratios can also be found at vigorous lava lakes such as Pele, where smaller lava fountains balance out the emission from the cooled lava crust that covers most of the lake. Similar activity such as this can be seen at a much smaller scale at the Erta'Ale lava lake in Ethiopia, shown at night in the image at the top of this post and at above right. Quiescent eruptions, such as those with insulated lava flows (where lava flows from the source to the flow front via lava tubes) or episodically overturning lava lakes, have much lower 2 μm : 5 μm ratios as their thermal emission is dominated by cooling lava with only small areas of recently emplaced lava. 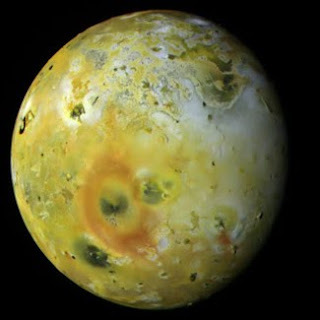 Such activity can be seen at Io's large, persistent flow fields like Amirani, Zamama, and Prometheus or the multitude of volcano depressions like Altjirra Patera. Combined with analysis of terrestrial data, the authors found that low 2 μm : 5 μm ratios typified volcanic eruptions with "older surfaces, increasing insulation [more lava flowing through lava tubes to breakouts], and quiescent emplacement". Eruptions with a high 2 μm : 5 μm ratio (> 0.5) suggest the presence of "younger [flow] surfaces, decreasing insulation, and more violent emplacement. Eruptions with greater overall radiant fluxes have increasing effusion rates and lava with lower viscosity and less silicon dioxide (less silicic). This ratio must also be combined with repeat observations for temporal coverage. This allows for the disambiguation between vigorously active lava lakes, open-channel lava flows, and lava fountains, for example, which are active for different timescales. Finally, the authors provide suggests for applying their method to data from future spacecraft to the Jupiter system and Io. For example, they suggest that temporal resolution trumps spatial and spectral resolution for monitoring the progress of a volcanic eruption, particularly for understanding processes at different temperature regimes (though high spatial resolution observations are great for spotting small scale features like skylights over active lava tubes). For example, observations with a temporal resolution on the order of 1-10 seconds, or less, are useful for obtaining temperatures from vigorously active lava bodies such as lava fountains. Observations with scales on the order of a few minutes to hours are useful for monitoring changes in the flow rate at open-channel lava flows, while lava lakes and insulated lava flows can be observed on a daily to weekly basis. They also suggest that thermal imagers on future spacecraft use a few, select wavelength windows such as 2 and 5 microns, and others in the thermal infrared between 8 and 12 microns for monitoring different volcanic eruption styles. 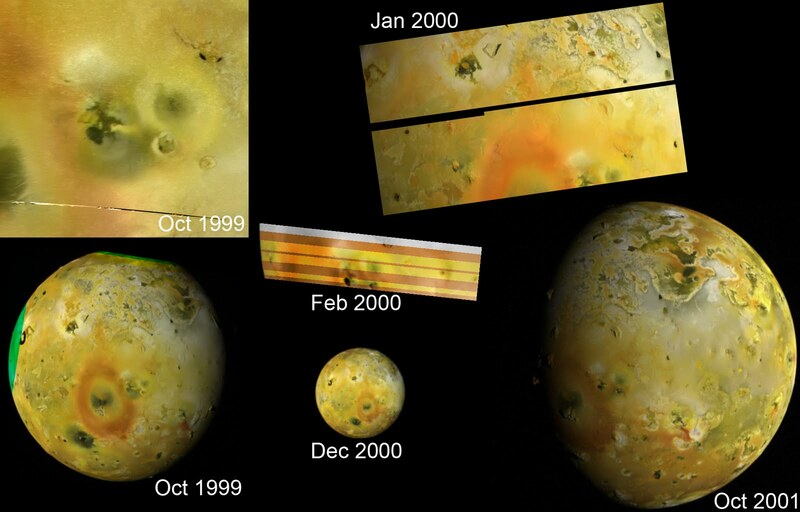 On Friday, I posted a note about Franck Marchis' observations of Io using the Keck Telescope's adaptive optics system on June 28, 2010. 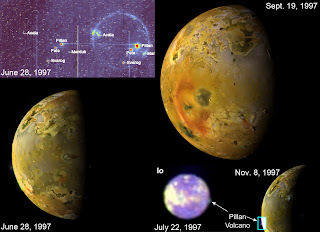 These observations allow us to sneak a peek at the ongoing volcanic activity on Io's anti-Jovian hemisphere. Their images revealed hot lava at several volcanoes like Pillan Patera (the most intense hotspot seen on that date), Isum Patera, Marduk, Prometheus, and Volund (not Zamama as previously suspected). These hotspots were seen in both 3.8 μm and 4.7 μm wavelength images, in the near infrared. 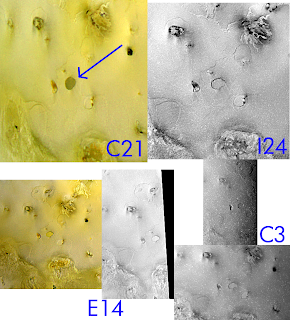 Hotspots were seen in only the 4.7 μm wavelength image, indicative of more cooled lava, at Rata Patera, Culann Patera, near Kurdalagon Patera, Tupan Patera, near a patera at 42.5 South Latitude, 172.5 West Longitude, and at a patera located at 6 degrees South, 190 degrees West. All but the last of these hotspots was seen before by either Galileo or New Horizons as active volcanoes. None of these hotspots were seen in the 2.1 μm image, suggesting that none of these volcanoes were vigorously active on June 28. The 2.1 μm instead showed Io's surface in reflected sunlight. Silicate materials show up as dark in the 2.1 μm image, while sulfurous materials show up as bright. Now as Franck pointed out, this isn't the most exciting set of results. Save one new hotspot, all the others were seen as active before and none are currently in an outburst phase. But regardless, it is important to observe Io more often to understand what is typical in terms of volcanic activity on the satellite. How often do outbursts occur? You are not going to know that if some observing days reveal none. Exciting, okay, maybe not, but VERY useful. Anyways, I was a bit curious about the one exception to this "boring" fest, the new hotspot at 6 degrees South, 190 degrees West. The patera this hotspot seems to be associated with is 60 kilometers by 45 kilometers in size. 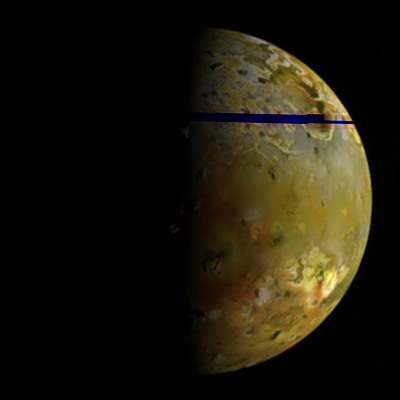 The image at left shows various views taken by Galileo during its mission between November 1996 and October 1999. As you can see, no changes were observed at this volcano during the Galileo mission, nor did the volcano look any different in New Horizons images taken in February 2007. While the 2.1 μm image from Keck has a very low resolution (150 km or so), there does seem to be dark spot associated with this volcano that would indicate the emplacement of dark lava, whereas before, the floor of the patera was covered with sulfurous materials. Very intriguing stuff that at least one volcano on Io seems to have reawakened.